This gem shows the vision of a man clearly rooted in his local landscape – he created the Chilterns in miniature! In 1928, Mrs Callingham made a short but moving speech in which she suggested that either the indoor model railway went, or she did. The model railway moved outdoors, and the rest as they say, is history. If you could take some of the wonderful buildings that make up the Chilterns, and placed them in a reasonably-sized garden in Beaconsfield, to be enjoyed at your leisure in an afternoon, you’d have all the ingredients for a magical model village called Bekonscot. Bekonscot’s rural idyll harks back to the bucolic days of the 1930’s, when the green fields of England were just one glass of warm beer and fuzzy summer days on the village green, playing cricket. And that is the time warp in which the village has made its home. 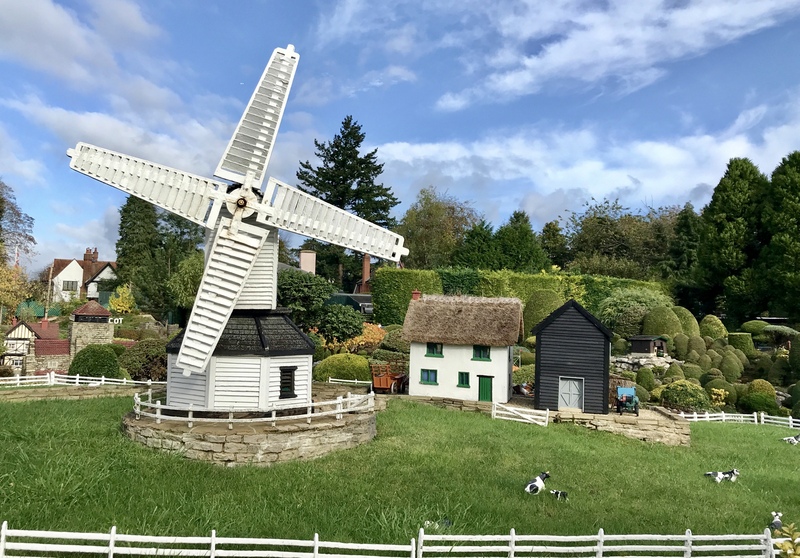 Model villages are popular with many British towns boasting an assortment of model buildings with their transport options, with perhaps the nearby Legoland at Windsor miniature Europe a particular treat. Model villages and model train sets, the two are destined to be alongside one another; in fact a model village without a model railway, is just not cricket! The narrow gauge railway at Bekonscott has played a key role in the construction, development and seems to have no shortage of eager passengers. Created in the 1920’s by local resident Roland Callingham (1881–1961), with the help of his gardener, cook, maid and chauffeur, he created a world of what was local and familiar to him, which he named Bekonscot, after Beaconsfield and Ascot, where he had previously lived. It started small, but when in 1928, Mrs Callingham made a short but moving speech which suggested that either the indoor model railway went, or she did, the model railway moved outdoors. It was never intended as a commercial visitor attraction, more a hobby to entertain Roland and his guests, who were by all accounts, very taken with it. Who wouldn’t be? It was only after 1930 that it really caught the wider public’s imagination, fed by Pathé newsreels, international and national newspaper coverage, and a Royal visitor or two, that ensured a steady stream of visitors. Ask a local, any local, and they will nod and say “ah yes, I visited as a child, you should go”. We did, and I could quickly see why its fan base is so loyal. The attention to detail is remarkable; each building, figure and vehicle, all in their place and looking as fresh as when they were first placed there, over 70 years ago in some cases. There is a working coal mine, Enid Blyton on a park bench, pubs, a windmill, a Waitrose (of course), a circus, penguin pool, lovers stealing a kiss and no end to model trucks, cars, trains, wagons and airplanes. A train, a plane, a carriage or cart madam? The quirky sense of humour, says ‘we don’t take ourselves too seriously”, evident on the various shop fronts including; Argue & Twist Solicitors, Alfred Kings’ cakes, the Barbers Strop and my favourite, McBull’s China Shop. Bekonscot has been run by the Church Army since 1978 and donates large amounts of money to charity. With over 15 million visitors since 1929 and endless rave reviews, this Chilterns gem has carved a niche that is timeless, innocent, and fun. And not just for small people either. In fact it was hard to tell ahem, who was having the most fun when we visited! I think it shows the vision of a man clearly rooted in his local landscape – he created the Chilterns in miniature! In a sleepy English village, you’ll discover the heady mix of local legend, the shadow of a ghost, a hermit and a royal executioner. The Dinton Hermit is heady mix of 18th century myths and legends makes for a most remarkable Buckinghamshire story. Just off the A418, once the turnpike between Thame and Aylesbury, is the small village of Dinton in the Vale of Aylesbury. As with so many ‘if you blink you’ll miss them’ English villages and hamlets, I was delighted that I had stopped to explore the pretty village and its castle, and was intrigued by what I saw, not realising at the time, the historical significance and surprising stories of a royal executioner, a ghost and a hermit with his leather shoes. I almost missed Dinton Castle, a Grade 2 listed folly, located just before the turn off into the village, Although the structure itself is not accessible, the footpath is close enough to take a look. Typical of follies, it was positioned to be seen for miles around and was built by Sir John Vanhatten, former owner of Dinton Hall in 1769, who used the castle to store his collection of fossils. The octagonal two-storied structure, with circular towers east and west, has some lovely features including unusually large ammonites set into the the exterior walls, most likely found in local quarries. On the site of a Saxon burial, it comes with its own ghost too, according to the estate agents sales patter, when the place was put up for auction in 2012. Local legend says the folly is haunted by the ghost of Simon Mayne, 17th century regicide of King Charles. In January 1649, Simon Mayne magistrate and Member of Parliament for Aylesbury, was also a judge of the High Court of Justice at the King’s trial, and 40th of 59 signatories on the Royal death warrant, which ultimately sealed his fate. After the Restoration in 1660, he was tried as a regicide and imprisoned in the Tower of London where he died in 1661. 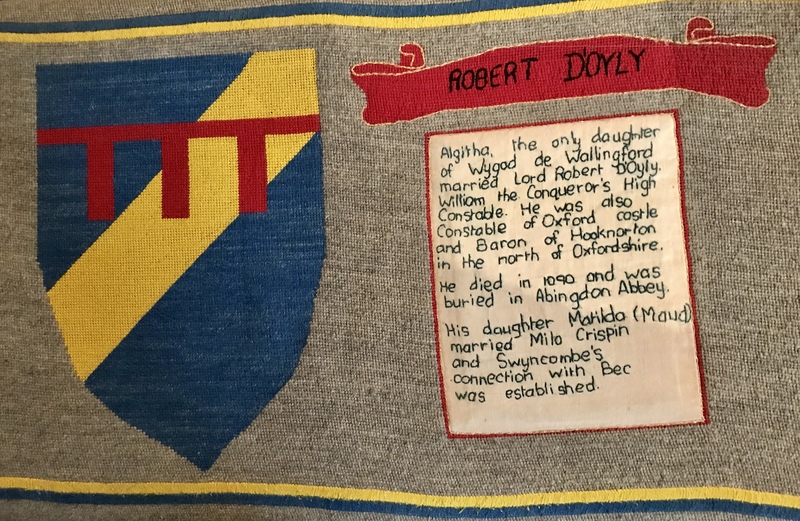 His body was returned to Dinton and is buried in the church. Buckinghamshire and the Chilterns are closely associated with the English Civil War, with John Hampden, of Great Hampden, the most notable of English politicians involved in challenging the authority of King Charles in the build-up to the Civil War. Things then take a weird turn with a handmade shoe on display in the Ashmolean Museum in Oxford that once belonged to John Bigg, the ‘Dinton Hermit’ (1629 – 1696). A man of reasonable means and former clerk to the afore-mentioned Simon Mayne, legend has it that Bigg may have been one of the hooded executioners of the king – one of the men who wielded the axe! About the time of Simon Mayne’s death, John Bigg became a hermit, living in an underground cave at Dinton Hall for 35 years until his death in 1649. As with any self-respecting local legend, there are many versions of the truth, with some believing that Bigg feared retribution for his involvement in the royal execution, whilst others suggest it was due to the tremendous remorse he felt. Either way, he was a survivor, and resourceful soul who only asked for one thing from his community – leather, which he would immediately nail to his clothes. 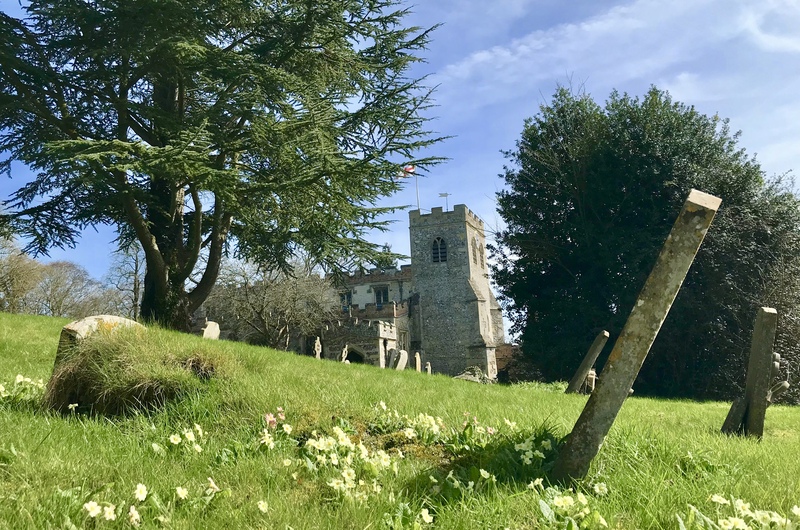 A heady mix of 18th century myths and legends makes for a most remarkable Buckinghamshire story. The 18th century illustration shows his strange horned cloak and the three bottles that hung from his girdle for strong and small beer as well as for milk. His shoes are particularly large and made from over 1,000 pieces of leather, one piece hammered on top of the other as they become worn. One shoe is on display in the ‘Ark to Ashmolean’ gallery on the Lower Ground floor of the Ashmolean Museum, whilst the companion to this shoe is still housed at Dinton Hall. His remarkable story and illustration was included in the wonderful ‘Portraits, memoirs, and characters, of remarkable persons, from the revolution in 1688 to the end of the reign of George II : collected from the most authentic accounts extant. Author: James Caulfield 1764-1826. Dinton Hall is a private residence, and nothing remains of John’s cave, and in January 2017, planning permission was granted by Aylesbury Vale District Council for the castle to be renovated into a two-bedroomed dwelling (building work is now well underway), but that shouldn’t stop you having a wander around the village. 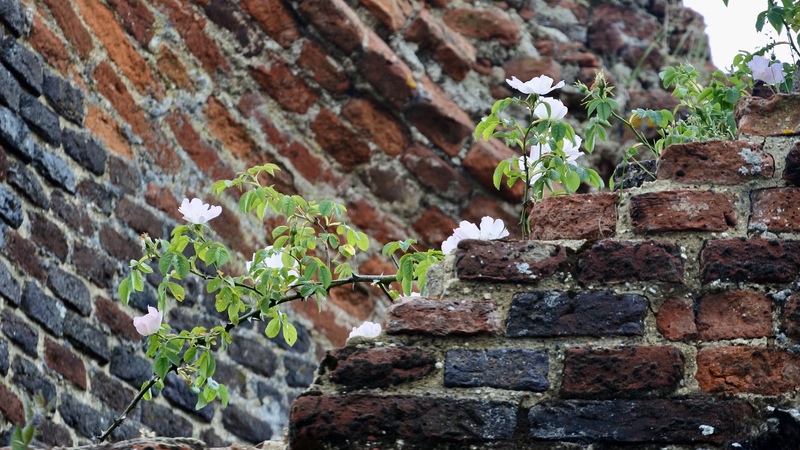 There are lots more quirky Chilterns stories, including the story of the Tring Tiles, Peter the Wild Boy and Growing Stones. Wednesday September 19th at 21.00 GMT, the folly will feature in the Channel Four Grand Designs programme with Kevin McCloud.